The Emerald Tablet of Trismegistus gives us the saying “As above, so below”; Jung, in my opinion, gives us the horizontal of “As within, so without,” making a linear cross , and the quaternity is symbolic of the manifest world. It can be measured. Processes are active verbs. They start out as abstractions, which even primitive man recognized, and since they were in nature, they were considered divine and given different names of gods and goddesses in different cultures, because the necessity of speaking about them required reifying images with names. A quick example of what this means is expansion, ruled by the planet Jupiter, which Roman god goes by many different names: Jove, as in jovial, and the French jeudi or the Norse god Thor, as in Thursday. Every culture has a name of this gift-bestowing process. We recognize the positive Santa Claus, or Falstaff. In the natal astrological chart, it shows generally where a person’s enthusiasm lies. That word breaks down to the Greek en-theos, to describe being possessed by a god within. Too much expansion runs into excess, physical obesity, gluttony, etc. I have Jupiter conjunct Mercury (communication) and so suffer from an excess of books and papers, now made worse by only being able to use my left hand! This process will be delineated later, but I hope you get the idea. To use a homely analogy: a cake baker sometimes uses a frosting bag with adjustable tips. The frosting itself is the same sugar but it now can be expressed in large, small, rippled, star-shaped spurts. Well, energy or prana is one force but it can be expressed in many different ways. The center of our Solar System is the radiating source of light, life, heat, and love. The planets reflect that light in different ways. Saturn’s lead, Jupiter’s tin, and Venus’s copper are symbolic ways that the radiant sun’s energy is reflected on our earth and every living creature and every atom hidden in matter. Mind-boggling! However absurd this sounds scientifically, the fact remains that these elementary processes do exist and function in outer nature and inwardly in each of our psyches. I have studied and lived reflecting on this for sixty-six years, only to become more and more convinced that this cosmic science we call astrology is in fact a symbolic language of archetypal processes. It is far, far more than just dealing with individual charts. It is in fact not only a spiritual guide to individuation, but a faint glimpse into the proof positive or “vast certainty” that some greater force is at work and that there is even a menu for the evolution of consciousness, a topic addressed in my The Heavens Declare. Somebody rightly said, There is another world and it is hidden in this one! Jung coined the concept of synchronicity as the meaningful coincidences that occur and flabbergast us by being so improbable. I call them Sophia’s Winks! And if you are reading this CREDO, chances are that you know full well what I am describing. I remember an incident in Heathrow Airport in London. I had to go to the Ladies. As I opened my cubicle door, a friend and member of a spiritual group in the USA walked past that narrow aperture! We had no idea either one of us was in England. She was on her way to Berlin and I was returning from Scotland to New York, as we discovered over a quick last cuppa in the busy airport. We had not seen each other for several years! Another instance was when I traveled with three young students of mine on Long Island , New York, to the Scottish Hebrides. We were in a rowboat off the west coast of Skye. There were three other men in the boat. As we headed to a remote peninsula, one of the men looked at one of my boys and said, “You must be Peter Murnane!” He was. The man had been a college friend at Yale with Peter’s father, and this boy was the image of his father. Coincidences happen; meaningful coincidences are synchronicities. Now, we have no symbolic life but we are all badly in need of [one]. Only the symbolic life can express the daily need of the soul, mind you! And because people have no such thing, they can never step out of this mill—this awful, grinding, banal life in which they are “nothing but.”… They are simply sick of the whole thing and that is the reason people are neurotic … and therefore they want sensation. They even want a war.… They say, “Thank heaven, now something is happening that is bigger than ourselves!”… Life is too rational, there is no symbolic existence in which I am something else, in which I am fulfilling my role, my role as one of the actors in the divine drama of life. Have you got a corner in your house where you can perform the rites, as they do in India … even a private spot where they can lead a symbolic life, renew their vows or meditate. Thus, it is my intention to write a series of CREDOS examining some of these basic processes and linking them to the planets they represent. Hopefully, we will begin to see how our Solar System may indeed be a hologram uniting infinite diversity as expressions of the One, as in uni-versal. To me a sacrament is an outward and visible sign of an invisible spiritual meaning. Uniting the two is the function of living that symbolic life. The true meaning of sym-bolos in Greek is putting things together, and its antonym is dia-bolos! 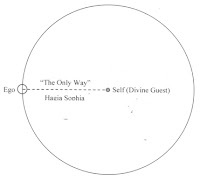 This literally means separating, the function attributed to the devil which separates the radius of Sophia’s Wisdom connecting the ego at the circumference and that mysterious centerpoint Jung called the Self, which like the individual wick in a candle holds the same flame of Spirit. We have to remember that a diagram is read with the right brain but what I am writing, you read with the left. So keep in mind that processes are active verbs. As Heraclitus says, “Everything flows. The river remains though the waters flow.” Thus the diagram is describing an active process! Heaven’s way is round, earth’s way is square. As the ancient Greeks proclaimed, “God geometrizes.” By that they meant that nature unfolds according to discernable patterns of consistent nature, true now even in the subatomic world. In addition, a symbolic value is implied. Unfortunately, I am unable to do justice to this, being limited to my computer, but I have written a book on the topic called The Web in the Sea: Jung, Sophia, and the Geometry of the Soul. It is a sequel to The Dove in the Stone: On Finding the Sacred in the Commonplace, so you know it is more conversations with Walter on Iona, but with illustrations of circles and squares, et al. However, I can give you an idea: Draw a circle and look at it. Can you see the whole circle? If you think you can, think again. What is the formula for a circle? It is π r squared and pi never ever comes out. So a circle is a mystery and stands for Spirit Unmanifest, which, no doubt, is the reason that Jung called the psyche a mandala and Joachim of Floris wrote, God is a circle whose center is everywhere and whose circumference is nowhere! This even hints at the suggestion that our solar system may be a hologram, hinting that everything is contained in everything! Phew! In the history of mathematics, the introduction of zero was a huge step! The three-dimensional of a circle is a sphere, and the dodecahedron fits into it with 12 sections! This hints at the nature of the Sun and the 12 Signs of the Zodiac. However, since this is symbolically static and radiant, the Moon adds its orbiting of our Earth, making 13! And this past December (2009), we saw that “blue moon” with two full moons in one month. Incidentally, the number 13 gave rise to all kinds of negative feminine projections in the superstitious Middle Ages, which surprisingly continue to this day. Friday (Freya’s or Venus’s day) the 13th was the double feminine whammy!! And even today, some hotels just don’t have a 13th floor! So the circle is an abstract concept. The visible constellations are actually an ellipse, as is the twisted form of the lemniscate or symbol for eternity. However, many things in nature are circular: the eye is circular and raindrops form circles, and the scorned dandelion’s pouf is a miraculous life-giving wonder! A streetlight shining through falling snow is a sermon in silence. It takes a compass to draw a circle. One point is stationary at the center, the other sweeps the circle. The visual result yields the glyphs of the Sun and the metal gold, and sheds light on Jung’s symbol for the mandala of the psyche, the point being the wick of the individual Self, which holds the same flame of the Spirit in every individual. Perhaps you are familiar with William Blake’s powerful work depicting God holding that compass. The square is symbolic of the manifest world. Why? Because it can be measured. The carpenter’s square and the compass are the symbols of the esoteric Ancient Order of Masons indicating that they knew of the symbolic import of these two factors for centuries. The three-dimensional forms of the circle and the square are the sphere and the cube. The Golden Rectangle employs both a compass and a ruler. There is no way I can convey the miraculous results of this figure! The Parthenon on the Acropolis in Athens is built in every detail according to its formula! It engenders not only the four proportions hidden in a pentagram, but also the spiral that one finds in a nebula, the water swirling in your toilet bowl, or the cowlick on a newborn’s head! The unfurling of a rose, the setting of seeds in a sunflower, and on and on. These geometric insights were familiar to the ancient Egyptians, Greeks, and Sumerians but were lost during the destruction of European civilization by the barbarian Goths, resulting in the Dark Ages, but were kept alive by the Islamic world and restored to Europe when the Moors invaded Spain around A.D. 711, which led directly over the following centuries to the Renaissance and, among many others, to a mathematician called Fibonacci. He discovered the Fibonacci sequence of numbers, in which each subsequent number is the sum of the two before, starting with 0 and 1: 0, 1, 1 (0+1), 2 (1+1), 3 (1+2), 5 (2+3), 8 (3+5), 13 (5+8)….. The ratio of each successive pair of numbers in the series soon converges on the Golden Number (phi), 1.618, the ratio expressed in the Golden Rectangle.